Love and other poems - sister-hood magazine. A Fuuse production by Deeyah Khan. The above poems were first published on Bangalore Review and have been reproduced with permission. 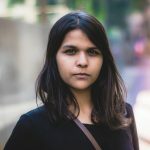 Writer & filmmaker based out of Bombay, third culture kid with stories centered on modern alienation, repressed desires and subverting societal roles. Straddled uncomfortably between film and prose, trying to find the elusive voice.